Hi, I am interested in your 1970 Pontiac GTO (stock #4690-ATL) listed on Autotrader for $42,995. I'd like to get more information about this vehicle and confirm its availability. Few classic muscle cars are more coveted by true enthusiasts than Pontiacs famed GTO. Memorialized in song and movie alike, the model is nearly as strongly linked with vintage car culture as asphalt itself, and this 1970 Pontiac GTO Convertible is a fine representative that also offers the added benefits of exhilarating open air motoring and a strong running powerplant beneath the hood. It will pull into its new home with PHS Documentation on board to attest to its authenticity, as well as a reproduction window sticker to provide some historical perspective. That vibrant red paint looks great on this 70 - if you were to ask a Pontiac aficionado to close his or her eyes and imagine a sharply decked out GTO, the resulting image would very likely feature this very color. Its just a flat out great looking car, featuring that distinctive split front grille its manufacturer graced its muscle car offerings of this era with, as well as prominent body contours on its sides that, because of the precise exterior alignment on display here, line up impressively well as they transition from front fender over sharp looking GTO emblems before moving on to the doors and rear quarter panels. A black vinyl convertible top stands by underneath its well-fitted boot to protect you from inclement weather and the added contrast heightens the visual appeal on display here even further, as does the fresh trim surrounding the windshield and covering the rocker panels. The interior features the same black color it had when this droptop first set rubber to asphalt and its looking nice and clean. The front buckets may well be originals, and they have a distinctive shape to them, with their extra width and headrests that give the appearance theyre molded to the tops of the seats. Fresh black carpeting lines the floor, ornamented by a pair of GTO floor mats up front. The dash area retains an almost entirely stock configuration, with the exception of a modern AM/FM/CD stereo with iPod compatibility and a set of aftermarket gauges to keep better tabs on vital motoring functions - both very sound and welcome additions. The trunk area in back looks very solid, with a fresh rubber seal sitting under the deck lid to keep moisture out and a full size spare on hand inside. This GTO offers rock solid drivability to match its great aesthetics. The 400 cubic inch V8 residing in the engine bay has received some nice upgrades, including a JEGs camshaft and a Holley 4-barrel carb that sits underneath a STK-style air cleaner that complements a pair of chrome valve covers and turquoise engine block. The engine is running great, firing up promptly and sending a nice, rich note out of the aftermarket headers leading to its dual exhaust. It pairs with a 4-speed manual transmission to provide just the hands-on driving experience youd want in a car like this, while the 3.55 gears in back offer a nice balance of off the line acceleration and good manners at highway speeds. Featured power steering makes for easy navigation, while power brakes that position discs up front bring this classic to a stop quickly. By the time this 70 rolled out, Pontiac had already begun equipping its GTOs with coil springs in both front and back, so it offers a smoother, quieter ride than many of its muscle car counterparts as it cruises on its set of 14 Pontiac wheels outfitted with BF Goodrich T/A Radials. 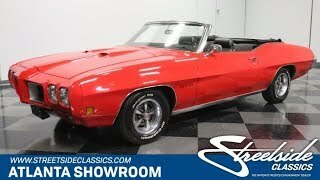 Outstanding signature looks and a super strong running condition make this 1970 Pontiac GTO Convertible one to put at the top of your must see list. Call today!